This article first appeared in Personal Wealth, The Edge Malaysia Weekly, on August 21, 2017 - August 27, 2017. 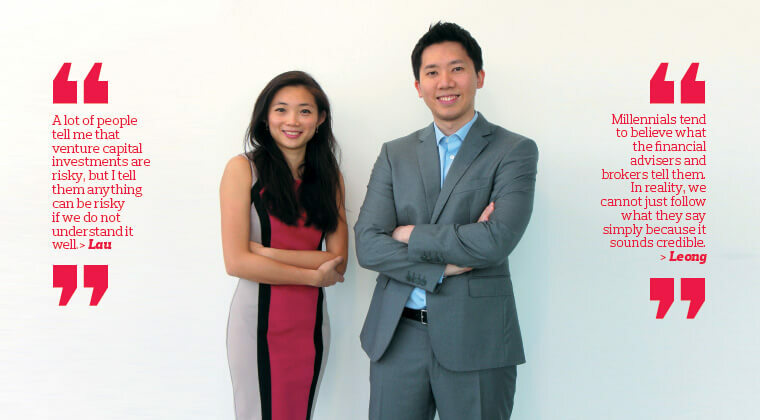 The problem with millennial investors is that many of them still lack financial literacy while others tend to be overconfident when investing, says Rachel Lau, co-founder of venture capital firm RHL Ventures. These issues must be addressed so they can make more informed investment decisions. “A lot of my peers do not fully understand how to invest. They tend to follow the herd and blindly chase returns without weighing the risks,” she says. Millennials are known for having an overinflated belief in their own abilities. That is why this generation is overconfident and underprepared when it comes to managing their money. According to a study by George Washington University and the US National Endowment for Financial Education in February, millennials consider themselves far more knowledgeable financially than they actually are. The study found that despite 69% of the participants giving themselves a high score in financial knowledge, only 24% showed basic financial literacy while a mere 8% demonstrated a high level of knowledge. “Most young investors think it is okay to follow what other people are doing with their investments. But this is not the case at all. When it comes to investing, there is no one-size-fits-all solution,” says Lau. RHL Ventures co-founder Lionel Leong concurs, saying that millennials tend to make hasty decisions and pounce on people’s advice without any hesitation. “Millennials tend to believe what the financial advisers and brokers tell them. In reality, we cannot just follow what they say simply because it sounds credible. I learnt this the hard way. Due to a slowdown in China’s economy and a surprise devaluation of the renminbi, the Hang Seng Index lost 12% in August 2015, its worst monthly performance since September 2011. Leong says he has learnt a lot since the event and highlights that it takes time to build trust with the brokers and do your homework so that you do not end up following the wrong advice. For Lau — the daughter of the late Lau Boon Ann, a non-executive director at Top Glove Corp Bhd — financial literacy and investment education started early. She says she was taught by her father every day on her way to school to go through stock quotes and make money by trading shares. She had a stock trading account by the time she was 16. Later, she worked as an investment analyst with Dutch investment manager NN Investment Management, where she was on the Asian equities team in Hong Kong, emerging market debt team in Atlanta and multi-asset strategies team in New York. She formed RHL Ventures at the end of 2015. Together with her close friends Leong (the son of Mah Sing Group Bhd group managing director and chief executive Tan Sri Leong Hoy Kum) and Raja Hamzah Abidin (the son of former federal territories and urban well-being minister Datuk Seri Utama Raja Nong Chik Zainal Abidin), Lau has invested in two tech start-ups. One is US-based mobile commerce application developer Sidestep Technologies Inc and the other is Singapore-based predictive mobile customer engagement and loyalty platform Perx. Sidestep allows users to pre-order merchandise at live music events, effectively letting them skip the long queues. RHL Ventures chose to invest in this company to replicate the billion-dollar live-event merchandising business in Asia-Pacific as well as extend the vertical into sports. The firm has invested in Perx to leverage the platform’s ability to fully engage with end users and tap the growth potential of the highly underserved Asian enterprise application space. “A lot of people tell me that venture capital investments are risky, but I tell them anything can be risky if we do not understand it well. For example, just because there are a lot of people investing in property, it does not mean that it is not risky. There is the risk that the tenant may run away or the developer may not do a good job and the whole property could collapse. There are so many risks associated with it,” says Lau. Lau, a highly experienced investor, has put her money in a number of assets — stocks, commodities, derivatives, properties, debt and everything in between. She even collects Japanese whisky as a form of passion investment. “The Japanese have the best whisky. The Yamazaki 35 years can go from US$4,000 to US$40,000 in just a few years due to its scarcity. Ever since the Chinese took interest in drinking it, the supply has been scarce. If you go to Narita or Haneda Airport, you can see that every shelf for aged whisky is empty,” she says. Being part of a venture capital firm means that the co-founders engage regularly with business owners, many of whom are still young. Leong says these business owners tend to jump into new ventures without properly assessing the risks and future consequences, so they should always remind themselves to take time to do the due diligence and look into their own financial standing to avoid being caught up in a tough situation. “Businessmen in our previous generation tend to prioritise the financial health of their businesses more than their personal wealth. They are so involved in their businesses that they put their heart and soul into building them and their economic value more than the allocation of funds in their personal accounts,” he says. “While this is not wrong, I think it is best if the young people who run businesses today spend a bit more time learning to grow their personal wealth and the nitty-gritty of their business projects before starting them because once they do, they will get busy. They won’t have any spare time for anything else.